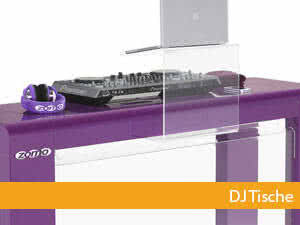 Tables for DJs are available in different sizes and from different materials. In our shop you will find tables in all price ranges and colours to match your furnishings in your living room or DJ studio. You can find out which details you need to pay attention to when buying the DJ table (also called DJ Plut) in our special and extensive guide for DJ tables. We are one of the largest and most renowned suppliers of DJ furniture in the world and offer a wide range of tables, storage boxes and other furniture for DJs, studios and similar areas. Whether you are looking for DJ tables in wood or metal, in aluminium or stainless steel, you will surely find what you are looking for with us. We offer models for a DJ set of turntables, a set with a DJ controller or for studio applications or for the big stage appearance. Of course, there are special preferences of each individual. The current working height for DJ tables is 1.1 meters, which consists of a table height of one meter and a mixer height of approx. 10 cm. The DJ desk, including the equipment, is about the same height as a bar counter in a bar or club. The width depends on your equipment. A turntable table needs more space than a desk for small CD or media players. The best way to measure the equipment is to measure it and then decide on a suitable width. 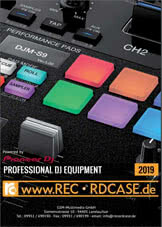 Don't forget that it is also very helpful if the DJ counter has room for headphones, monitors or other DJ accessories. The "common" materials are MDF wood fibre boards, which are additionally coated. The material is robust, resistant and insensitive to liquids. DJ tables made of metal are also very popular. These are also very robust, partly white, quick to assemble and disassemble and usually equipped with practical laptop holders. A high-quality table can be extended with accessories. For example, front panels made of acrylic glass, laptop stands, monitor mounts or lighting accessories are included in the range, so that the table can also be used for visual purposes.